Now that the holiday hubbub is over, I’ve got a new diversion to assuage my winter blue-blahs. 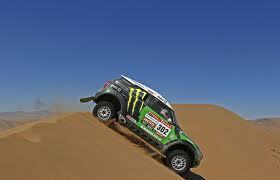 Epic, an overused word that truly applies to the annual two-week wilderness road race called The Dakar. Almost two hundred competitors gathered on January 1st at Mar Del Plata, Argentina to embark on a nearly 5,600 mile endurance adventure that continues into Chile and Peru. 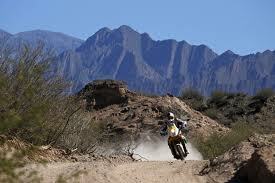 Using specially equipped motorcycles, cars, trucks and quads, these competitors and their support personnel traverse extreme topography of desert dunes, riverbed canyons, and treacherous mountain passes. 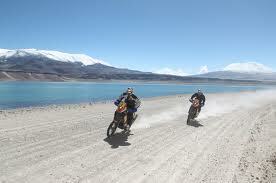 Racing over unpaved terrain, they endure both blistering 120 degree heat in the Adacoma Desert where there has never been any measurable precipitation as well as oxygen deprived elevations of 15,000 ft. at Paseo de San Francisco in Andes Mountains. The highest levels of skill and strength are required for this marathon, and still many will not see the finish line. On day-one, Jorge Boero, a motorcyclist, suffered a heart attack after crashing, and he died. Death has occurred 21 times in the event’s 35 year history. Despite that grim statistic, The Dakar continues to draw enthusiastic support from sponsors, drivers, crew, organizers, governing bodies, and fans. On stage three, my personal favorite in the motorcycle class, American Quinn Cody crashed. While his injuries were not life threatening, they were serious enough to force his early retirement from the event. He’s a great competitor, and while deeply disappointed, he conducted himself in exemplary good sportsmanlike fashion during the post disaster interview—blood, bruises, stitches, and all. Watching the half-hour long highlights show on the new NBC Sports channel is such a teaser, but it’s all we’ve got. I’d find time to watch hours of coverage if it were possible. The scenery is so spectacular and the competitor’s determination is so complete that I stare at the TV in utter amazement when it’s on. As totally far-fetched an idea as this is, I think it would be an opportunity of a lifetime to go in as a volunteer, perhaps serving up food in the bivouac or being a part of the team that tears down and relocates the camp daily. The enormity of logistical details is impressive, and I think I’d enjoy being a part of it, maybe just once, someday. 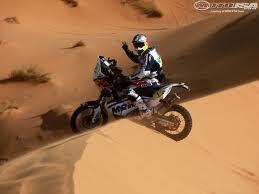 Here are a few Dakar 2012 pictures off the internet. 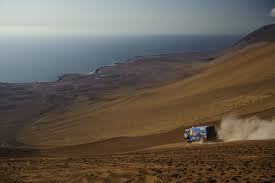 I’m drawn to The Dakar in the same way I’m drawn to The Tour de France; both depict the beauty of perseverance. In each case, it’s impossible to overlook how much more spectacular the journey is compared to the destination. Completion is great, but getting there is great too. As a writer, I appreciate that. There are no shortcuts. Epic tours, whether on a bicycle, a motorcycle, a Mini, or a semi truck, are hard work, but they deliver gifts that can’t be found elsewhere. Every time I sit down to write a short story or something bigger, it’s like heading down the road on an exciting but challenging journey. If I can remember the gorgeous scenery along the way of Europe’s Tour de France or South America’s Dakar, perhaps I’ll stay at it even when that wicked voice in my head says to give up. Until next time, have a great week, and I’ll post again next Friday. This entry was posted on Friday, January 13th, 2012 at 1:54 PM	and is filed under Uncategorized. You can follow any responses to this entry through the RSS 2.0 feed. You can leave a response, or trackback from your own site.